In a Sagamore vacation home, a light and bright space with a dual purpose. 1. White slipcovered chairs are from Restoration Hardware. “Slipcovers can be taken off and washed. Furnishings had to be able to be sat on with wet bathing suits. We didn’t want things that you have to worry about,” says Parkinson. 2. 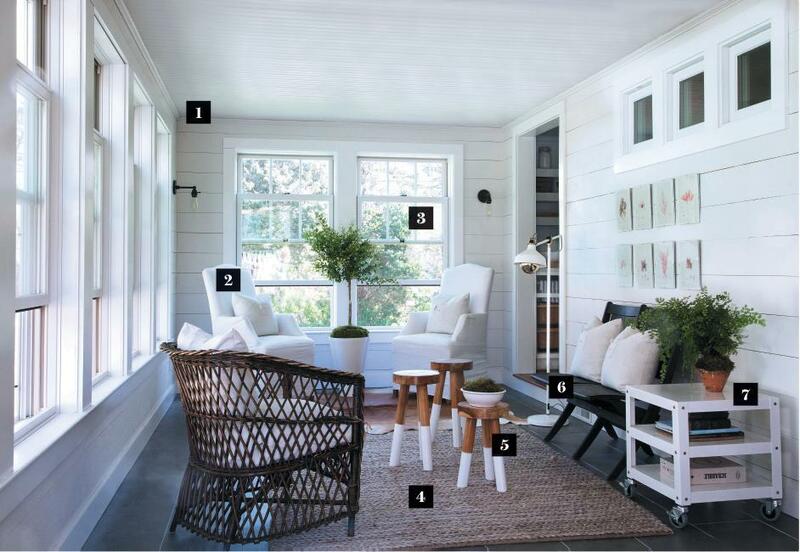 As a nod to the coastal locale, walls have shiplap paneling and the ceiling is clad with bead board, painted Benjamin Moore China White. 4. Vintage furnishings, including the black bench and wicker chair, are casual and hardy. 5. A metal table on casters from CB2 can be easily shuffled around the space. “There is nothing in the room that can’t be hosed down, wiped off, or swept up,” says Parkinson. 6. Walnut stools with “dip-dyed” white legs from Serena & Lily serve as extra surface area or a handy place to perch. 7. A highly durable sisal rug is a great choice for the room, says Parkinson. “You can’t see sand in it.” Floors are clad with dark gray porcelain tile. 8. By stealing a bit of space from the master bedroom, the washer and dryer were recessed into the wall. 9. A mahogany counter serves as a place to fold laundry. 11. 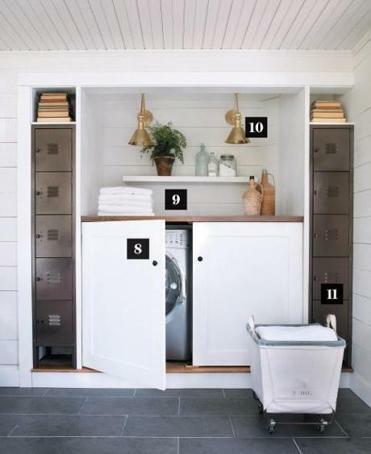 Vintage lockers — where laundry essentials are stored — were scored on eBay and painted dark gray at an auto body shop to match the floor.